I love your projects. And the colors! From the sweet colors in your Reyna to the vibrant colors in the cowl and the fun tweedy brown in the hat - they're all great. Thanks! 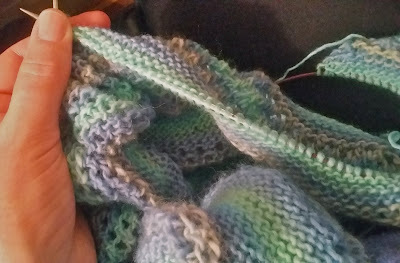 I'm like a toddler - I get bored easily so I end up knitting many things at once in many more colors. I almost wish you hadn't introduced me to the pattern. Now, every skein in my stash pile wants to be a Reyna. :) It's a relaxing knit though so it wouldn't be the end of the world if I knit massive quantities of them. Your projects are all wonderful! I'm knitting a Reyna right now, and it seems like a lot of other people are, too. That cowl is going to be amazing. Thank you! Yes, Reyna seems to have gone viral. It is a great pattern. VERY simple but with just enough pattern to keep me motivated.